This item has been fully reconditioned. Plus all the standard accessories from new. These items have been fully reconditioned. All the bearings have been checked and replaced where nessesary. Why Do You Need a Thickness Planer? There are two primary reasons for owning a thickness planer. Many more will occur to you as you use your new planer. The first and foremost reason is to ensure the consistency of the thickness of the stock you're using. Few problems are more frustrating than to start assembling your cut-to-size project components, only to discover that they're not fitting together properly due to inconsistencies in thickness. Assuming that all lumber (even from the same stock) is planed down to a consistent thickness, has been the downfall of many a project. The second reason is to save money by planing your own lumber to the thickness you want. When you need thinned stock for smaller gift projects, for example, these savings can be significant. If you can find 1/4", 3/8" or 1/2" thinned stock locally, you'll pay dearly for it. But, armed with a Shopsmith Bandsaw and one of our Planers, you can resaw two or three thinner boards out of a thicker one (up to 6" wide), then plane them down to the exact thickness you need..at a big savings! 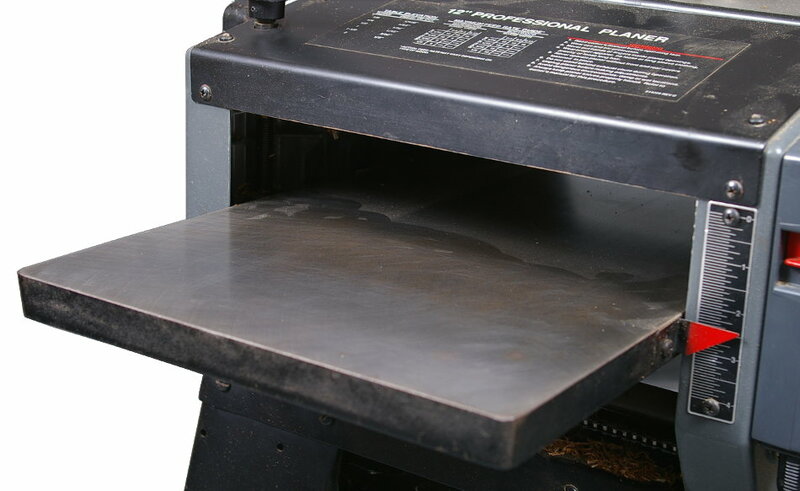 As with all Shopsmith Special Purpose Tools, your thickness planer offers great features to help you make everything you make -- better. Large 12" x 4" Capacity handles big lumber. All the throat capacity you need to smoothly and swiftly surface boards up to a foot wide. Generous 4-inch thickness capacity turns hefty, rough-sawn timbers into smooth, finished stock. Plenty of Muscle to tackle your toughest jobs. While the Mark 7/Mark V mount model will deliver up to 1-3/4 hp (or 1-1/8 hp on the Mark V) at infinitely variable cutterhead speeds of 3,000 to 4,100 rpm... the Pro Planer comes with its own operating stand and 1-3/4 hp motor that gives you a constant, 5,750 rpm cutterhead speed. 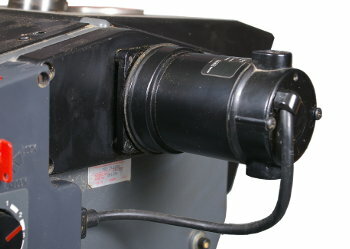 Separate Feed Motor won't rob cutterhead power. Both Shopsmith Planer models offer a separate feed motor that's completely independent of the cutterhead motor. 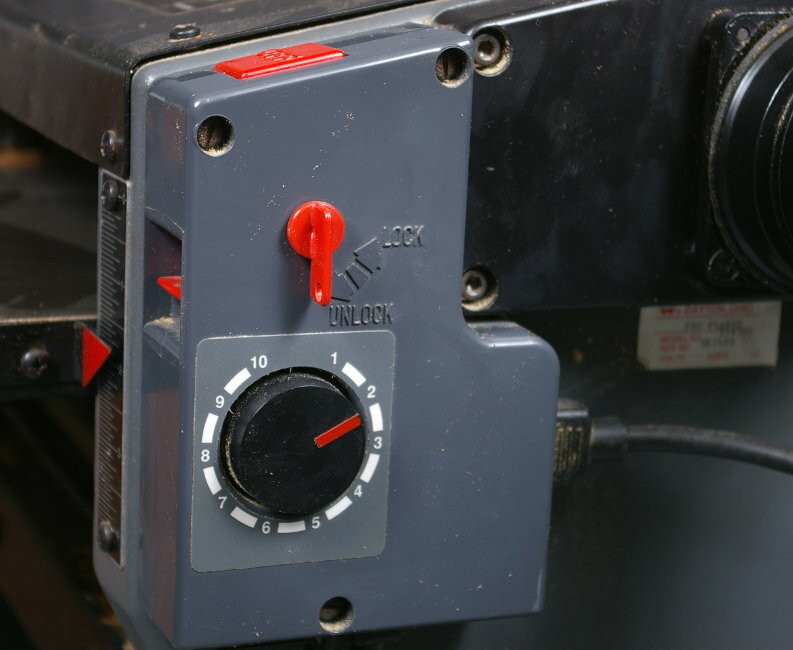 As a result, you'll achieve better, more consistent planer performance since each of the two motors is dedicated entirely to its own function. Variable-Rate Feed Control ensures super-smooth, mirror-finish cuts. Although the feed rate ranges vary slightly between the two models, both planers allow you to slow-down or speed-up the feed rates to produce as smooth a surface as you'd like -- at the simple twist of the feed rate dial. 28" Long Table provides unrivaled support. The Shopsmith Planer has one of the longest tables of any 12" planers on the market today. Its rigid, durable cast construction eliminates leveling problems and ensures proper infeed and outfeed support and consistent depth-of-cut on every board. High-Grip Feed Rollers help prevent slippage. The serrated steel infeed roller grabs every board (even thick, 4" timbers) with a secure, non-slip grip and pushes it through the cutterhead at a constant feed rate to produce that super-smooth finish. The long-lasting, hard rubber outfeed roller then grasps the board as it exits the cutterhead, pulling it through at that same rate and completing the cut without marring or scratching the surface. 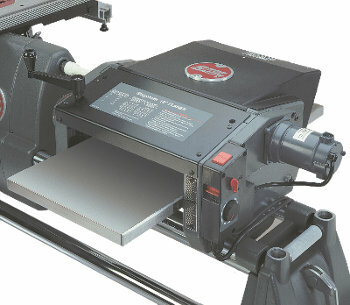 Two Shopsmith Planer Choices -- Which is Best For You? 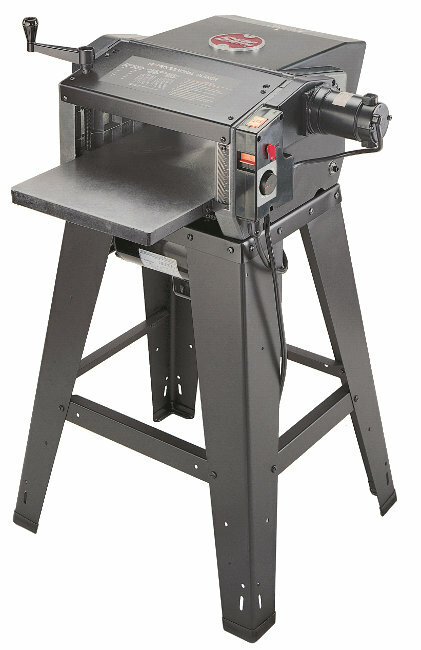 Shopsmith offers a choice of planer models to fit your woodworking style. Shopsmith 12" Pro Planer is ideally-suited for the woodworker with a little more space and a frequent need for precisely dimensioned timber. They'll appreciate having the Pro Planer mounted on its own stand, ready to go to work. Shopsmith 12" Mark-Mounted Planer is an excellent choice for woodworker with limited space, a more limited budget or who only occasionally build tolerance-critical projects. Maximum Width Of Cut 12" 12"
Maximum Depth Of Cut 3/32" 1/8"
Maximum Stock Thickness 4" 4"
Minimum Stock Thickness 3/32" 3/32"
Table Size 12-1/2" x 28" 12-1/2" x 28"